I always preach the power of the Tarot journal from the rooftops. If you're a committed student, it can make all the difference. It allows you to chart your progress, to observe your developing understanding and, of course, it's a creative outlet too, if that's an area of interest for you. I enjoy making my journals as colourful as possible. It's an artistic indulgence to an extent but the pictorial aspect also means it's easier to find things as I'm flipping through, looking for inspiration as I reminisce over my past thoughts and discoveries. 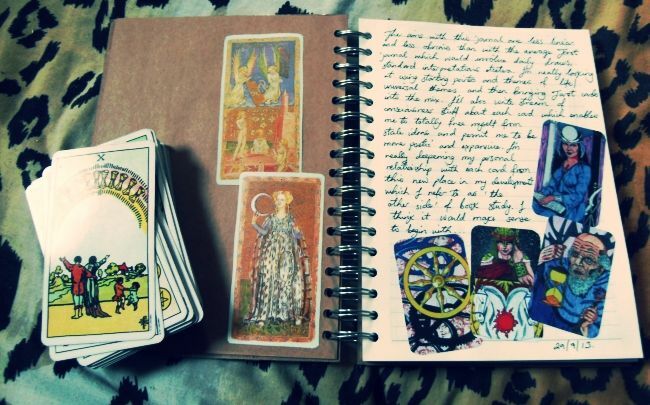 Some people hugely enjoy the Daily Draw approach to Tarot journalling and I really encourage this. I also think it's great to consider universal concepts (love, death, ambition, anger etcetera) and consider which cards apply most strongly to them. Permit your contemplations to flow and see how much you can discover, when you read back, about your underlying perceptions of the cards you chose. I teach Tarot for self-development and this is because I see the cards as an incredible mirror of the human experience in all its gore and glory. In its entirety, it's a symbol of true individuation. If you have a conscious emotional understanding of each card then it's likely that you have achieved a very conscious understanding of your own human experience. This is intensely meaningful to me and the more I think about it, the more meaningful it seems to become! I love talking with fellow Tarot students about 'problem cards' and helping to trouble shoot them as much as possible. This is because I genuinely feel that the cards which present blockages for you are the ones which can help you deal with some aspect of your Shadow. There is usually a reason that a certain card presents obstacles to understanding or a general, unexplained feeling of revulsion. I like to delve into that and see what we can find out. So, I'm now at this whole new precipice in my own Tarot learning, beginning yet another journal and really pouring all of my new perceptions into it. I can't wait to share my new ideas and to engage in any dialogue which can be generated by the desire to keep peeling back the layers and taking as much soul food from the deck as possible.